Dairy Queen® restaurants in South Dakota have joined forces to help their neighbors who lost livestock during the October "Atlas Blizzard." 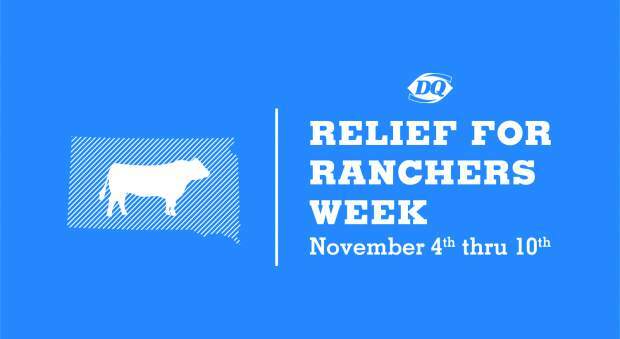 The DQ® Relief For Ranchers week will be Nov. 4 – 10. At least $1 from every burger sold at 34 participating Dairy Queen locations will go to the Rancher Relief Fund. "We realize that the Dairy Queen restaurants wouldn't exist without the back breaking work that our farmers and ranchers in South Dakota put into their trade," said Tara Knapp, owner of the Belle Fourche DQ Grill & Chill® restaurant and Designated Marketing Area (DMA) Chairperson for Rapid City area. "Ranching is not just a business, but a way of life. It only makes sense that we help our friends, neighbors and business partners in their time of need." The goal for the week-long event is to sell 25,000 burgers across the state andraise at lease $25,000 for the Rancher Relief Fund, a cooperative effort of the South Dakota Cattlemen's Association, the Stockgrowers Association, the Sheep Growers Association and the Black Hills Area Community Foundation. Participating DQ locations in the Rapid City area include: all locations in Rapid City, Belle Fourche, Custer, Hot Springs, Martin, Spearfish, Sturgis and Wall. Additional participating DQ locations include: Brandon, Brookings, Canton, Chamberlain, De Smet, Eagle Butte, Groton, Huron, Madison, Miller, Mitchell, Mobridge, Sisseton, Redfield, Vermillion, Watertown, Winner, Yankton and all Sioux Falls locations. For more information about the Dairy Queen system, visit DairyQueen.com. For more information about Rancher Relief Fund visit http://www.giveblackhills.org.